World map showing the location of Asia. Two-point equidistant projection of Asia. Asia is the largest and most populous continent or region, depending on the definition. It covers 8.6% of the Earth's total surface area, or 29.4% of its land area, and it contains more than 60% of the world's human population. Asia is traditionally defined as part of the landmass of Africa-Eurasia – with the western portion of the latter occupied by Europe – lying east of the Suez Canal, east of the Ural Mountains, and south of the Caucasus Mountains and the Caspian and Black Seas. The word Asia entered English, via Latin, from Ancient Greek Ασία (Asia; see also List of traditional Greek place names). This name is first attested in Herodotus (about 440 BC), where it refers to Anatolia; or, for the purposes of describing the Persian Wars, to the Persian Empire, in contrast to Greece and Egypt. Herodotus comments that he is puzzled as to why three women's names are used to describe one land mass ( Europa, Asia and Libya, referring to Africa), stating that most Greeks assumed that Asia was named after the wife of Prometheus but that the Lydians say it was named after Asias, son of Cotys who passed the name on to a tribe in Sardis. Even before Herodotus, Homer knew of a Trojan ally named Asios, son of Hyrtacus, a ruler over several towns, and elsewhere he describes a marsh as ασιος (Iliad 2, 461). The Greek term may be derived from Assuwa, a 14th century BC confederation of states in Western Anatolia. Hittite assu- = "good" is probably an element in that name. Alternatively, the ultimate etymology of the term may be from the Akkadian word (w)aṣû(m), which means "to go out" or "to ascend", referring to the direction of the sun at sunrise in the Middle East, and also likely connected with the Phoenician word asa meaning east. This may be contrasted to a similar etymology proposed for Europe, as being from Semitic erēbu "to enter" or "set" (of the sun). However, this etymology is considered doubtful, because it does not explain how the term "Asia" first came to be associated with Anatolia, which is west of the Semitic-speaking areas, unless they refer to the viewpoint of a Phoenician sailor sailing through the straits between the Mediterranean Sea and the Black Sea. Medieval Europeans considered Asia as a continent – a distinct landmass. The European concept of the three continents in the Old World goes back to Classical Antiquity, but during the Middle Ages was notably due to Isidore of Sevilla (see T and O map). The demarcation between Asia and Africa is the Isthmus of Suez and the Red Sea. The boundary between Asia and Europe is commonly considered to run through the Dardanelles, the Sea of Marmara, the Bosporus, the Black Sea, the Caucasus Mountains, the Caspian Sea, the Ural River to its source, and the Ural Mountains to the Kara Sea near Kara, Russia. While this interpretation of tripartite continents (i.e., of Asia, Europe, and Africa) remains common in modernity, discovery of the extent of Africa and Asia have made this definition somewhat anachronistic. This is especially true in the case of Asia, which would have several regions that would be considered distinct landmasses if these criteria were used (for example, Southern Asia and Eastern Asia). Generally, geologists and physical geographers do not consider Asia and Europe to be separate continents. Physiographically, Asia is the major eastern constituent of the continent of Eurasia – with Europe being a northwestern peninsula of the landmass – or of Africa-Eurasia: geologically, Asia, Europe, and Africa comprise a single continuous landmass (save the Suez Canal) and share a common continental shelf. Almost all of Europe and most of Asia sit atop the Eurasian Plate, adjoined on the south by the Arabian and Indian Plates, and with much of Siberia situated on the North American Plate. In geography, there are two schools of thought. One school follows historical convention and treats Europe and Asia as different continents, categorizing subregions within them for more detailed analysis. The other school equates the word "continent" with a geographical region when referring to Europe, and use the term "region" to describe Asia in terms of physiography. Since, in linguistic terms, "continent" implies a distinct landmass, it is becoming increasingly common to substitute the term "region" for "continent" to avoid the problem of disambiguation altogether. Given the scope and diversity of the landmass, it is sometimes not even clear exactly what "Asia" consists of. 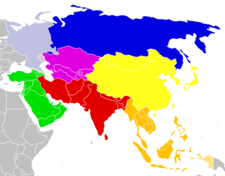 Some definitions exclude Turkey, the Middle East, Central Asia and Russia while only considering the Far East, Southeast Asia and the Indian Subcontinent to compose Asia. The term is sometimes used more strictly in reference to the Asia-Pacific region, which does not include the Middle East or Russia, but does include islands in the Pacific Ocean — a number of which may also be considered part of Australasia or Oceania although Pacific Islanders are commonly not considered Asian. The demonym ' Asian' often refers to a category of people from a subregion of Asia instead of being used as a mere adjective for anyone from the (Asian) continent. In British English, 'Asian' usually refers to South Asian, but may also refer to other Asian groups. In the United States, ' Asian American' is usually taken to mean East Asian Americans due to the historical and cultural influences of China and Japan on the U.S. up to the 1960s and in preference to the terms ' Oriental' and ' Asiatic'; however, the term is increasingly taken to include Korean Americans, Southeast Asian Americans, and South Asian Americans due to the increasing demographics of these groups. 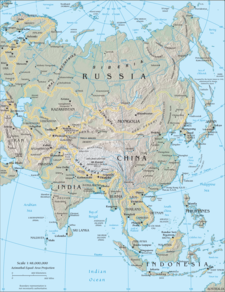 Physical map of Asia (excluding Southwest Asia). In terms of gross domestic product ( PPP), the largest national economy within Asia is that of the People's Republic of China. In the late 1990s and early 2000s, the economies of China and India have been growing rapidly, both with an average annual growth rate of more than 7%. China has the world's second-largest economy after the United States, followed by Japan and India. However, in terms of exchange rates (nominal GDP), Japan has the largest economy in Asia and second-largest of any single nation in the world, after surpassing the Soviet Union (measured in net material product) in 1986 and Germany in 1968. (NB: A number of supernational economies are larger, such as the EU, NAFTA or APEC). Economic growth in Asia since World War II to the 1990s had been concentrated in few countries of the Pacific Rim, and has spread more recently to other regions. In the late 1980s and early 1990s, Japan's economy was almost as large as that of the rest of the continent combined. In 1995, Japan's economy nearly equalled that of the USA to tie the largest economy in the world for a day, after the Japanese currency reached a record high of 79 yen. But since then, Japan's currency has corrected and China has grown to be the second-largest Asian economy, followed by India, in terms of exchange rates. It is expected that China will surpass Japan in currency terms to have the largest nominal GDP in Asia within a decade or two. Manufacturing in Asia has traditionally been strongest in East and Southeast Asia, particularly in mainland China, Taiwan, Japan, South Korea and Singapore. The industry varies from manufacturing cheap goods such as toys to high-tech products such as computers and cars. Many companies from Europe, North America, and Japan have significant operations in Asia's developing countries to take advantage of its abundant supply of cheap labour. One of the major employers in manufacturing in Asia is the textile industry. Much of the world's supply of clothing and footwear now originates in Southeast Asia. Asia has three main financial centres: in Hong Kong, Singapore and Tokyo. Call centres and business process outsourcing (BPOs) are becoming major employers in India and the Philippines, due to the availability of a large pool of highly skilled English speaking workforce. The rise of the business process outsourcing industry has seen the rise of India and China as other financial centres. Map of Asia published in 1892. The history of Asia can be seen as the distinct histories of several peripheral coastal regions East Asia, South Asia, and the Middle East linked by the interior mass of the Central Asian steppes. The coastal periphery was home to some of the world's earliest known civilizations, each of them developing around fertile river valleys. The civilizations in Mesopotamia, the Indus Valley, and the Yangtze shared many similarities. These civilizations may well have exchanged technologies and ideas such as mathematics and the wheel. Other innovations, such as writing, seem to have been developed individually in each area. Cities, states and empires developed in these lowlands. The central steppe region had long been inhabited by horse-mounted nomads who could reach all areas of Asia from the steppes. The earliest postulated expansion out of the steppe is that of the Indo-Europeans, who spread their languages into the Middle East, India, and the borders of China, where the Tocharians resided. 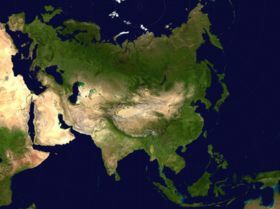 The northernmost part of Asia, including much of Siberia, was largely inaccessible to the steppe nomads, owing to the dense forests, climate, and tundra. These areas remained very sparsely populated. The centre and the peripheries were mostly kept separated by mountains and deserts. The Caucasus and Himalaya mountains and the Karakum and Gobi deserts formed barriers that the steppe horsemen could cross only with difficulty. While technologically and socially, the urban city dwellers were more advanced, in many cases they could do little in a military aspect to defend against the mounted hordes of the steppe. However, the lowlands did not have enough open grasslands to support a large horsebound force; for this and other reasons, the nomads who conquered states in China, India, and the Middle East often found themselves adapting to the local, more affluent societies. Asia is home to several language families and many language isolates. Most Asian countries have more than one language that is natively spoken. For instance, according to Ethnologue, more than 600 languages are spoken in Indonesia, more than 415 languages spoken in India, and more than 100 are spoken in the Philippines. Korea, however, is home to only one language. Other Asian writers who won Nobel Prizes include Yasunari Kawabata (Japan, 1966), and Kenzaburo Oe (Japan, 1994). The story of Great Floods find reference in most of the regions of Asia. The story is first found in Mesopotamian mythology, in the Epic of Gilgamesh. Hindu mythology tells about an avatar of God Vishnu in the form of a fish who warned Manu of a terrible flood. In ancient Chinese mythology, Shan Hai Jing, the Chinese ruler Da Yu, had to spend 10 years to control a deluge which swept out most of ancient China and was aided by the goddess Nuwa who "fixed" the "broken" sky through which huge rains were pouring. The story is also found in the Tanakh, Bible and Qur'an. Asian philosophical traditions originated in India and China and cover a large spectrum of philosophical thoughts and writings. Indian philosophy includes Hindu philosophy and Buddhist philosophy. 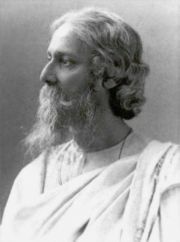 They include elements of nonmaterial pursuits, whereas another school of thought from India, Carvaka, preached the enjoyment of material world. Taoism was founded by Chinese philosopher Lao Zi, who lived 605-520 B.C. 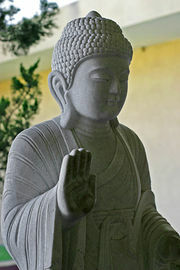 Buddhism was founded by Siddhartha Gautama, who lived 563-483 B.C. The Abrahamic religions of Judaism, Christianity, Islam and the Bahá'í Faith originated in West Asia. The Dharmic religions of Hinduism, Buddhism, Jainism and Sikhism originated in South Asia. In East Asia, particularly in China and Japan, Confucianism, Taoism, Zen Buddhism and Shinto took shape. Other religions of Asia include the Zoroastrianism, Shamanism practiced in Siberia, and Animism practiced in the eastern parts of the Indian subcontinent and in Southeast Asia. Today 30% of Muslims live in the South Asian regions of Pakistan, India and Bangladesh. The world's largest single Muslim community (within the bounds of one nation) is in Indonesia. There are also significant Muslim populations in China, Iran, Malaysia, the Philippines, Russia, and most of West Asia and Central Asia. In the Philippines and East Timor, Roman Catholicism is the predominant religion; it was introduced by the Spaniards and the Portuguese, respectively. In Armenia, Eastern Orthodoxy is the predominant religion. Various Christian sects have adherents in portions of the Middle East, as well as China and India. Buddhism: Bhutan, Cambodia, China, Japan, Korea, Laos, Malaysia, Mongolia, Myanmar,Nepal, Singapore, Sri Lanka, Thailand, Vietnam, parts of northern, eastern, and western India, and parts of central and eastern Russia (Siberia). Mahayana Buddhism: Bhutan, China, Japan, Korea, Malaysia, Singapore, Vietnam, parts of the Philippines. Theravada Buddhism: Cambodia, parts of China, Chittagong Hill Tracts, West Bengal, Laos, mainly northern parts of Malaysia, Myanmar, Sri Lanka, Thailand, as well as parts of Vietnam. Vajrayana Buddhism: Parts of China, Mongolia, Tibet, parts of northern and eastern India, parts of central, eastern Russia and Siberia. Daoism: China, Korea, Singapore, Taiwan, Vietnam. Hinduism: Bangladesh, Bali, India, Malaysia, Nepal, Pakistan, Sri Lanka, Singapore. Shamanism: Indonesia, Laos, Myanmar, Thailand, Siberia. Sikhism: India, Malaysia, Hong Kong. Yezidi : Iran, Iraq, Syria, Turkey. Christianity: Armenia, East Timor, Georgia, India, Indonesia, Lebanon, Malaysia, Pakistan, Palestinian territories, Philippines, Russia, Singapore, South Korea, Syria. Judaism: slightly fewer than half of its adherents reside in Asia; Israel, India, Iran, Russia, Syria.